One of the key goals of a college education is "learning how to learn"--preparing students with the skills to become life-long learners. Education in the humanities plays a vital role in the learning of these skills by marrying discussions of technique with content-based activities which help students develop proficiency with key skills. Included here are a series of student aids that GBC Faculty have used in their classes to promote key skills necessary for student success at the collegiate level. In the Spring of 2013, GBC President Dr. Mark A. Curtis wrote a series of articles for the Elko Free Press. 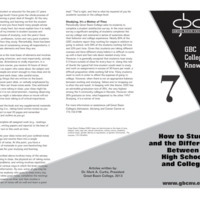 Entitled the "GBC College Knowledge" series, these eight articles aimed to help first-time college attendees understand the college environment. In this article, Dr. Curtis explains the nature of education at the collegiate level, how it differs from that students experience at the secondary level, and provides some advice to bridging the difference. The pamphlet is available in both English and Spanish. 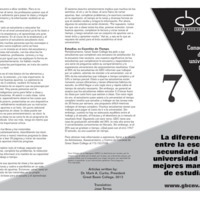 The entire series of 8 pamphlets, in both English and Spanish, is available in the GBC College Knowledge Collection. Too many students arrive in college with poor note-taking skills. While digital technology provides an easy means of looking up and verifying factual information, note-taking is still a valuable skill in dynamic environments where relationships between facts must be captured--such as in a classroom discussion or business meeting. The Cornell Note-Taking System was developed by Dr. Walter Pauk, director of Cornell University's Reading and Study Center and author of How to Study in College. Pauk's system has been widely used in colleges since the 1960s because it provides an emphasis on synthesis, analysis, and application over simple recall of information (see Keil Jacobs, "A Comparison of Two Note Taking Methods in a Secondary English Classroom" in Proceedings: 4th Annual Symposium: Graduate Research and Scholarly Projects , Wichita State University, April 25, 2008). 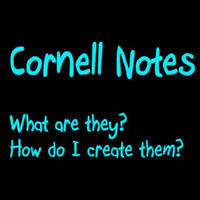 This video developed by S. Clowes covers the basics of the Cornell Note-Taking System that I have been using as an optional student resource since 2013 within a WebCampus page on "Collegiate Study Skills."